July, 2016 | adaptifyed™ The Adaptifyed system for monetizing downloadable files is covered by U.S. patents: US9451011B2, US14318109, US15243350, and pending application: US20150007256A1. How to save the ad industry? 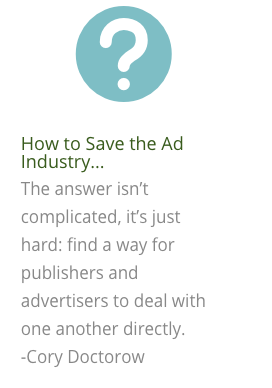 The answer isn’t complicated, it’s just hard: find a way for publishers and advertisers to deal with one another directly.